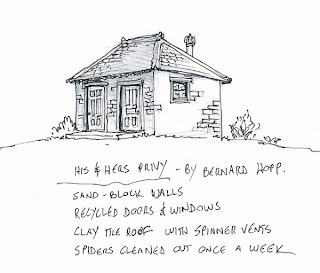 Bernard Hopp, owner and sole resident of Hopp's Store, needed a privy for his traveling customers, so he called on Faramond the Architect to design one. Water is scarce so a flush toilet would not work. 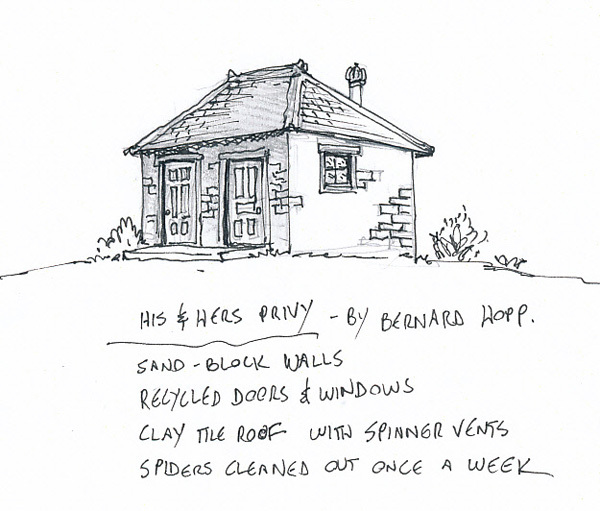 Faramond came up with the His and Hers Privy shown above. It is built with pressed sand-and-cement blocks made from local dune sand. The doors, windows and clay roof tiles are all recycled. Local craftsmen did the job in about a week, not counting the pit. It is rumored that some ancient artifacts were found by the guy who dug the privy pit, but he has since disappeared. 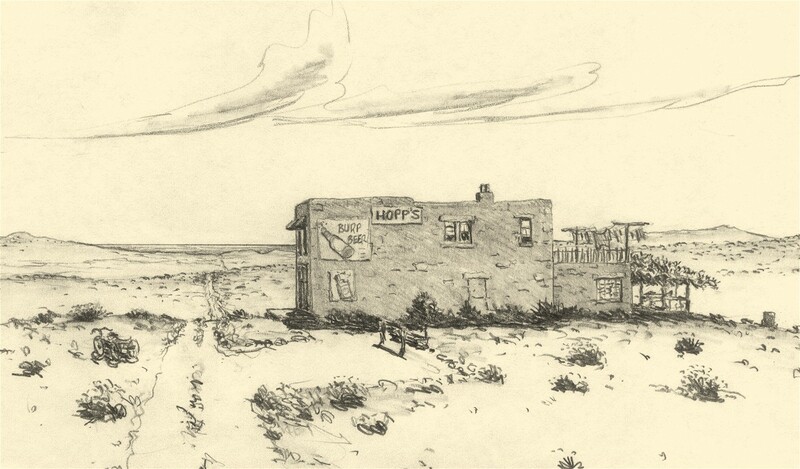 Hopp's Store is the only settlement (pop. 1) in this part of the Sheffield Desert. 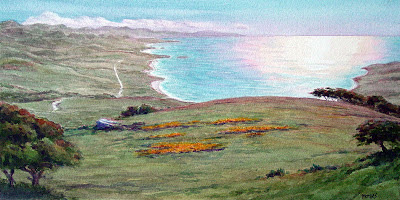 Travelers on their way to the North Bight beaches and to Roger's Dreamland often stop in for refreshments. Bernard does what he can, but is often short on these. However, he has the finest comic book collection in this part of the world - just ask him for anything from vintage Disney, all the DC Superheroes, R. Crumb to obscure series such as "Animal Crackers". Bernard also owns the only known copy of "Kaiser Spinks Comics". If he is not in the store should you visit, ring the hand-bell on the counter. 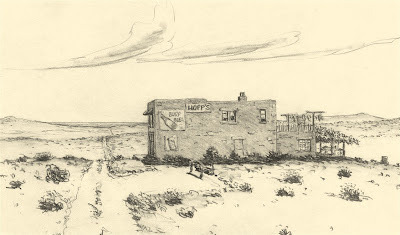 Hopp's Store with the distant ocean beyond, as pictured a few years ago. The new privy is in the back by the burn barrel. 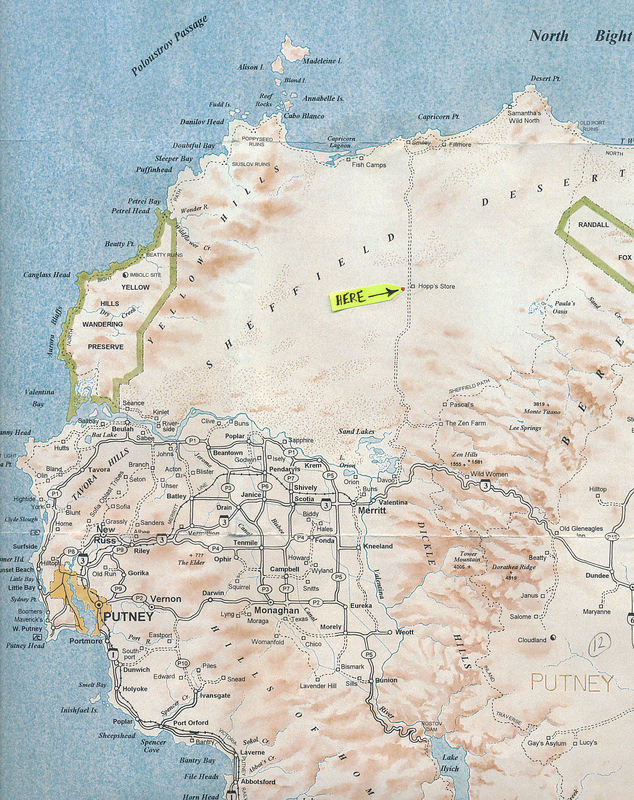 Below is Hopp's location in New Island's Sheffield Desert. This is the view from Soltaire's Thistledown Plot shortly before construction. 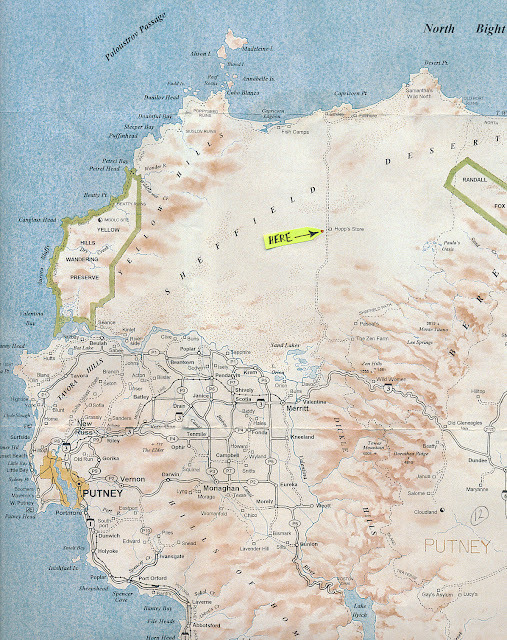 New Island's eastern coast can be seen as far as East Cape, about 55 miles to the north. That's Otter Bay in the foreground and the Wicklow Mountains to the right. Soltaire's home, at right, and the studio-gallery, at left. 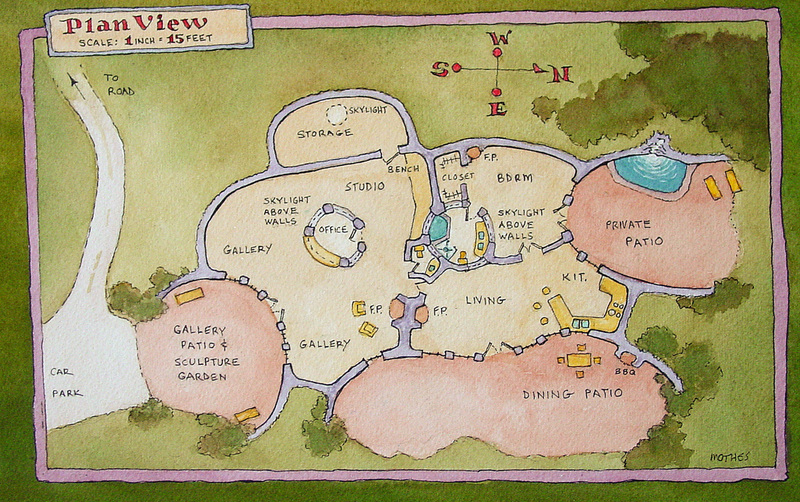 The village of Blum's Inn is seen in the lower right corner. The twice-daily M25 Islebus is passing by the driveway, at left.